The Roses of J.-P. Vibert - Site de lejardindemamereeng ! Who is Jean-Pierre Vibert ? 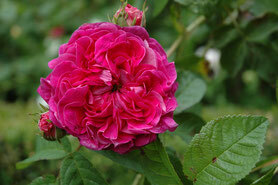 It is not at all about the famous rose breeder of the XIXth century but about his present-day name sake. By virtue of his ancestors and his rich professional career path in horticulture, Jean-Pierre Vibert II became at a very early stage fascinated by old roses. Wishing to deepen his knowledge and rediscover the know-how of the first rose growers, he ventured from 1990 onwards and more intensely after his retirement into the hybridization and creation of new roses. The task he set himself is characterized by the fact that he started to work on rose varieties of different species (Gallica, Centifolia, Muscosa…) in order to obtain new varieties in the antique categories of before 1850. Subsequently, wiser for his experience, he continued quite naturally his research on various families of wild roses that until then had been little or not all developed or that were known to be difficult to hybridize. He obtained, among others, new varieties by hybridizing rugosa roses with Gallica ones, thus creating a new category: the Rugo-gallica. Nowadays, with 200 creations of roses spread over some thirty species to his name, Jean-Pierre Vibert II is now a past master in the art of multiplying roses and continues passionately his search, relentlessly favouring new paths of discovery. His achievements, the ones even more beautiful than the others, are a delight and deserve their place in our gardens for two reasons: apart from their esthetical quality, they bring back to life the romantic and poetic scenery of the big parks of bygone times. 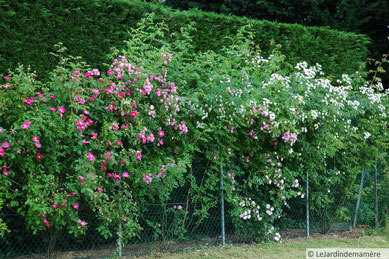 At the moment I have more than 70 different varieties of shrubs and climbers that were created by Jean-Pierre Vibert II. They are spread over my two gardens and reveal the richness of his achievements that I gladly show to my visitors. A remarkable point: some climbers of rampant growth are now covering the full outer wall of the property, thus offering their luxuriant blossoming to the public.